CAMARILLO, Calif., April 6, 2017 – Semtech Corporation (Nasdaq: SMTC), a leading supplier of analog and mixed-signal semiconductors, announced its updated portfolio of circuit protection solutions suitable for protecting Internet of Things’ (IoT) gateways and end nodes from threats induced by electrostatic discharge (ESD) events. IoT technologies are rapidly proliferating as enterprises, consumers and government agencies begin to implement “smart” infrastructure into day-to-day processes. At the heart of this emerging trend is Semtech’s industry-leading LoRa® Technology. Semtech’s LoRa wireless RF technology is enabling IoT gateways and end nodes for novel and compelling IoT applications and use cases. The LoRa-based gateways and end-nodes within this infrastructure typically operate in demanding industrial environments and are surrounded by a rich array of data ports and other interfaces that benefit from Semtech’s high-performance ESD protection platforms. Semtech’s RClamp protection platform provides best-in-class protection performance to safeguard these data interfaces from ESD and overvoltage threats. The RClamp platform features industry-leading low clamping voltage and ultra-low capacitance for safeguarding sensitive data transceivers while also maintaining robust signal integrity. Semtech LoRa Technology is a widely adopted low-power, long-range solution for IoT that gives telecom companies, IoT application makers, and system integrators the feature set necessary to deploy low-cost, interoperable IoT networks, gateways, sensors, module products, and IoT services worldwide. 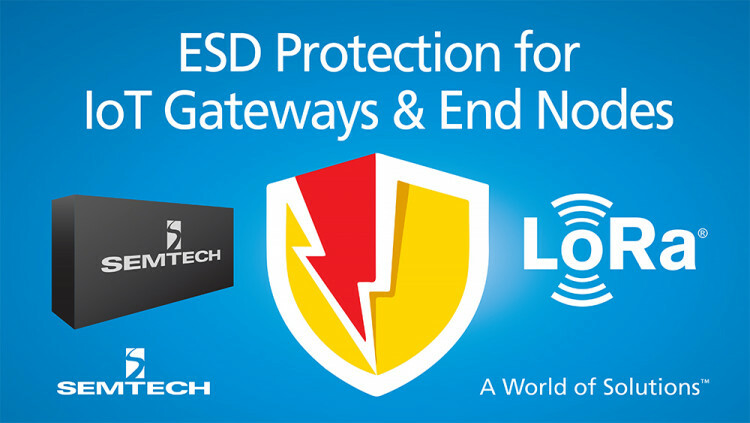 Learn about Semtech’s ESD protection products. Sign up for Semtech’s e-newsletter Inside Circuit. All statements contained herein that are not statements of historical fact, including statements that use the words “will,” “begin to,” “to enhance,” “designed to,” or other similar words or expressions, that describe Semtech Corporation’s or its management’s future plans, objectives or goals are “forward-looking statements” and are made pursuant to the Safe-Harbor provisions of the Private Securities Litigation Reform Act of 1995, as amended. Such forward-looking statements involve known and unknown risks, uncertainties and other factors that could cause the actual results of Semtech Corporation to be materially different from the historical results and/or from any future results or outcomes expressed or implied by such forward-looking statements. Such factors are further addressed in Semtech Corporation’s annual and quarterly reports, and in other documents or reports, filed with the Securities and Exchange Commission (www.sec.gov) including, without limitation, information under the captions “Management’s Discussion and Analysis of Financial Condition and Results of Operations” and “Risk Factors.” Semtech Corporation assumes no obligation to update any forward-looking statements in order to reflect events or circumstances that may arise after the date of this release, except as required by law. Semtech, the Semtech logo, LoRa, RClamp, and Z-Pak are registered trademarks or service marks of Semtech Corporation or its affiliates. Third-party trademarks or service marks mentioned herein are the property of their respective owners.